New generation 2 in / 2 out USB 2.0 audio interface with condenser microphone, stand clips, headphones and cables. Very handy interface to work with. The headphones are the golden piece of the package along with the microphone! Great piece of kit. High quality sound in an inexpensive package. For pro recordings the claret is a better choice, but for the purposes of streaming and podcasting this is perfect. Can’t go wrong for the price! Simply amazing, easy for any user, and beautiful design, my bedroom looks quite better with the scarlett now, so it's a win win. Once you try it you will understand why so many people love this combo. For what it is, it's just perfect. Really easy to set up and use and works perfectly. Remember that it is a budget starter kit so obviously the mic is not the most incredible on the market (is only cardiod and doesn't have pads, for example), but does what it's supposed to really really well with a clear pickup. I could not have less complaints. produit de très bonne qualité et une bonne qualité d'enregistrement, parfait pour commencer en ce qui me concerne. I am very satisfied with the Scarlett 2i2 Studio 2nd Gen. The delivery was the next day, from UK to Switzerland. The installation was simple and very intuitive. I could use it immediately. It's amazing! Everything is really good quality, it's all simple to use and sounds great! I'm very happy I made the choice to purchase. Incredible product for me! I'm not experienced with audio interfaces and such but this was very straight forward, everything's included, everything clear. Audio interface itself is very good. I'd recommend it as a beginner audio interface. The mic sounds crisp and clear. Headphones have a very poor build quality but they're alright sound-wise. I bought the refurbished version. The product was very clean. I did not try the equipment much yet, but it seemed to work fine when I first tested it out. The box containing the equipment had been opened, but I guess that makes sense, since it is refurbished equipment. I'd never used an audio interface before and the Focusrite 2i2 Studio just arrived. My firsts days of experience with the product have been great, it's easy to use, I say that because I don't have any experience with audio recording. The installation of drivers and software took me less than an hour and the setup of all the studio less than 10 minutes. The headphones sound really great. Hope I can take the best advantage of this product! Badly designed. No software to record on device, and "driver" incompatible with Windows 7 (this is why there is an explanation on their website). You are led to purchase more software so you can record, but once you do that, the driver will not work on Windows 7. The service received from placement of order on ecommerce website to secure payment using visa, shipping and reply to support messages. Thank you focusrite. The best product for starter producers. If you will init in the music, it's the best choice! It’s the best products for my first ever home studio. It’s very easy to set up and it comes along with quite a few software which is the best. Everything is best for this , price and quality. Excellent cost benefit, great sound low latency and ease of use. Good equipment if you start producing!! It is the best studio pack to start with you own home studio, and thanks to the microphone (which has great specs) you can record any instrument or sound to make samples. Great product for beginning and medium producers. Good quality of sound and low latency. Love it! One of the best things to save up for if you're a beginner at producing/recording! Easy to use and delivers what it promises ! Unboxing was a pure delight. The only problem I have is that the headphone isn't really a good one. Should you need a good headphone you're better off with something else. Is the best option I've ever had to make music. I'm impressed with this technology. I really appreciate your effort to process and ship my product immediately after placing the order. But I'm still un happy with your Partner selection for shipment, UPS. I'm yet to receive my product. It reached Bangalore, India on 13th July'17 and I still do not know when I will receive my Product. They do not provide update on the status of the shipment, where they are stuck, all the telephone numbers published on their website does not work, through email you will have to send them several notes to get an response which again does not help. Last they told me that they are working on Customs clearance around 3 days back and then again all is quite. I'm really doubting now if my investment will be able to reach me now or not. Now I'm feeling that I should have ordered something else from Amazon site and not directly through you. Please stop dealing with UPS and help me get my product to my doorstep as promised. Fast shipping and great products. Headphones could have a more controlled bottom-end. The microphone, too sounds a bit too "boxy". But for the price, definitely worth it. Great console and software bundle the differences on the recording quality worth it. My only complay its about the delivery, I had to pay really extra charges. This was an amazing deal for the package. The headphones and mic have great sound quality and the interface is very easy to use. Professional product with online support and updates. Best home studio audio interface to begin with, very complete bundle. To celebrate my Guinness World Records attempt for charity on #GivingTuesday, we're giving THIS away to one lucky winner! Your audio starts here. This is simply the best you can get. If you care about your audio look no further than Focusrite Scarlet 2i2 (2nd Gen ). A great system for a singer/songwriter. Now I can hear my ideas before I try them with a live audience. 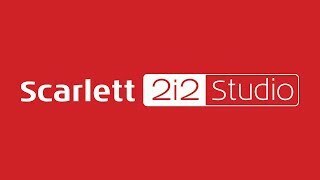 The Scarlett 2i2 Studio is a great product. Great sounding mic, great phones and great interface. You have everything you need in one box. I I particularly like the more headroom the preamps give and the bundles of plugins that came with. The Plugin-In Collective is a great idea guys ! Keep on rockin' ! Just a superb little machine and the microphone, headphones and leads are all of excellent quality too. I cannot praise how good the quality is enough, and relatively straighforward to set up the free DAW software too. Scarlett 2i2 is the best selling USB audio interface in the world, and for good reason. We've focussed on three things; achieving the best sound, the fastest speed and the easiest experience. The latest generation is improved in all three areas. It is compact yet versatile, with two natural-sounding Scarlett mic preamps, super-low latency* and the same class-leading sound quality and digital conversion as the rest of the latest Scarlett range. Connect the large diaphragm CM25 condenser mic, plug in your guitar or a second microphone, and immediately capture studio-quality sound. Plug in the HP60 closed-back headphones for honest playback without any distracting background noises. Connect your speakers, crank up the volume and totally immerse yourself in sound. The latest generation Scarlett range is packed full of upgrades. New super-low latency* will bring confidence to your performance, letting you record and monitor with software effects in real time. New metal gain controls and a sleeker red metal chassis underscore its improved industrial design, built to go anywhere. The Scarlett range also now operates at sample rates all the way up to 192kHz, and the input channels have evolved too. The latest Scarlett mic preamp features a more even gain structure, so you can accurately set your levels, and the instrument input has also been completely redesigned so it can handle seriously hot guitar pick-ups. Finally, Focusrite have provided analogue protection circuitry across both the inputs and the outputs, to guard your interface against unwanted power surges. Compact and portable enough to take anywhere, you won't even need a power supply; Scarlett 2i2 is connected and powered by a single USB cable. Scarlett 2i2 works with all major DAWs on Mac and PC. It also comes with the software and effects you need to start recording; an exclusive version of Pro Tools | First Focusrite Creative Pack, Ableton Live Lite, the Softube Time and Tone Bundle, Focusrite's Red Plug-In Suite, Novation's Bass Station virtual instrument and 2GB of Loopmasters samples. Studio quality HP60 closed-back headphones. 2 in / 4 out USB 2.0 Audio interface with two Mic/Instrument preamplifiers, 24bit & USB Bus Power.